The Macmillan Coffee Morning this year was held on 5th September at the Recreation Room on The Green. Marion Brown and her team of helpers organised the event from 11am to 1pm which was an informal get together to enjoy coffee and biscuits and support this popular cancer charity. 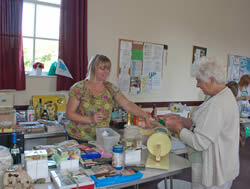 There were several stalls on the day with raffles, a table top "bring and buy" and a tombola. Of the raffles drawn on the day there were many prizes kindly donated by local people and businesses. The Wine & Dine prizes were won by Madge Mould and Jill Hargreaves who won vouchers to spend at Prezzo. TMS of Gainsborough kindly donated 2 of the top Tombola prizes of 2 x 5kg bags of chicken (won by Dorothy Dawson and Jill Hargreaves). Grateful thanks also went to volunteers who helped on the day and for all the other donated prizes. The day was a huge success with over £715 raised (previous year £686) and was enjoyed by all.